I had one of those mornings today where I had a mini mommy breakdown. There were no tears involved, but I was overly flustered. More than I should have been probably, but sometimes you just get to that point where enough is enough. I can't exactly say that things around here have been going badly, but things just haven't been smooth sailing. We finally conquered the stomach virus. Everyone but me got it (Praise the Lord for that one!). Even the dog was throwing up (which, if I'm being honest, isn't that abnormal). Michael and I informed Ethan this weekend that he had one goal in life. That goal...was simply to make it to school today. He's missed 6 days in a row thanks to sickness and various other things. I'm surprised they aren't out for me for truancy! Low and behold he woke up yesterday from his nap screaming bloody murder pointing at his ear. Hello, first time ear infection. I should probably consider myself lucky for him making it this long without one. Part of me just wanted to scream though. I'm no nurse. That is for certain. Sickness is not my specialty. Thankfully ear infections do not require E to stay home from school. We both were ready for a break of being cooped up in the house together. Most importantly today was the Halloween Parade at school and I was determined for Ethan to wear his costume at least once this year. Thanks to this foul weather I doubt there will be any Pumpkin Patches or Trick-or-Treating in our future. My little ray of sunshine decided he was no longer interested in being the cow that we had been building up for months and months. It was an epic battle getting him in his costume this morning and obviously picture taking did not go well. Even though the focus is horrible, I'm pretty sure you can read exactly what those eyes are saying to me. I'm pretty sure I was the only crazy driving to school with the windows rolled down this morning in our beautiful 39 degree weather. Oh well. Toddlers right? What can you do? Things have been crazy lately and I know I'm going to want to slap myself later for saying this, but I'm looking forward to having Jackson because it will be a reason to slow down. I said having a newborn meant things were going to slow down. You can officially put me in the looney bin now. We are now a mere 6.5 weeks away from delivery and still have a billion things to check off our Pre-Baby To-Do List. This pregnancy has been so much easier than my first. I'm not sure if it's just because I've been too busy to focus on it or if I'm just in better shape this time around. I'm still on track to gain near 40 pounds this go around much to my dismay. I think I'm at a 30 pound gain at this point and I'm just throwing my hands in the air. Apparently it's just my number. I feel good though. This baby moves around like crazy (probably just to remind me that it's there). I'm emotionally ready to have this baby now. I'm ready for newborn cuddles. I'm ready for it to just be time. Oh my gosh, look at that belly! :) You are totally, 100% all belly. Too cute. That baby is lowwwwwwwwwwwwwwwwwwwwwww. You are gorgeous! Praying things get easier and slow down a bit before baby Jackson comes. Toddlers are tough. 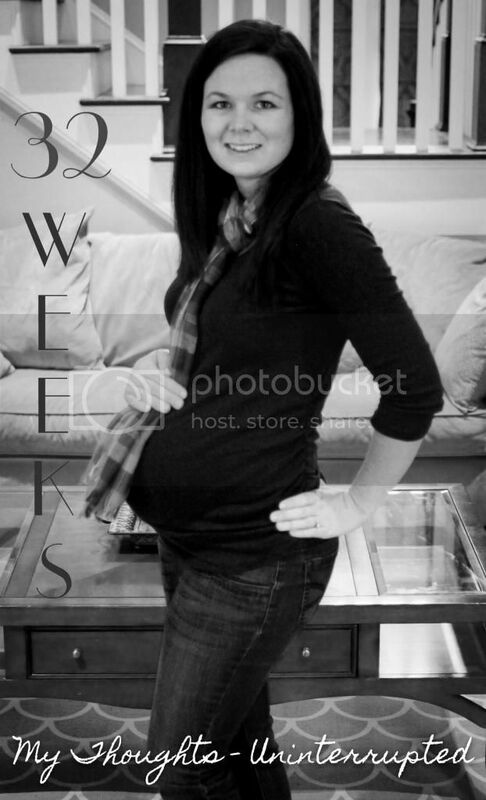 You look great and I can't believe it's only 6.5 weeks away!! 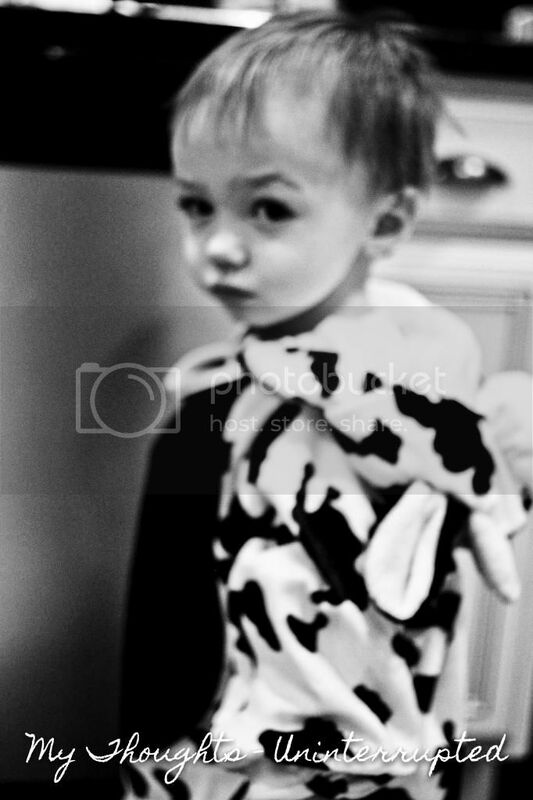 Ethan looks super adorable as a cow even if he decided that was not his thing. We had a minor meltdown upon putting on Meyer's costume too...must be a 2 year old "thing"!